After seven years, the Cleveland Cavaliers are playing their first game without LeBron James. And they got their first one. Playing back in the Q, the Cleveland Cavaliers got their first win in as many tries and delivered the first loss to the Boston Celtics, who defeated LeBron James and the Miami Heat one night ago. With a packed arena that had the atmosphere of an NBA Finals Game 7, JJ Hickson led the Cavs with 21 points to their first victory, giving possibly a lot of hope to the fans of Cleveland that life may be good after all without LeBron. 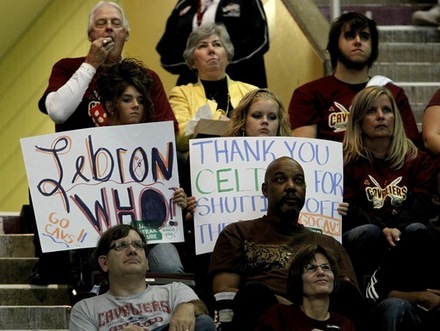 Cleveland fans were grateful for Boston, since the Celtics beat LeBron one night earlier, and then lost to the Cavs. With this win, I don't expect to see much of these. The game was a tight one for three and a half quarters, where no team was able to hold on to a good lead. Until the last half of the 4th quarter, where Anthony Parker broke a tie at 86 with a three pointer shot at the last second of the 24 second shot clock. And it was all Cleveland from there, where Daniel Gibson, scoring all of his 16 points in the second half, scored 4 crucial free throws in the final seconds to clinch the first LeBron-less win 95-87. Meanwhile, Rajon Rondo was in charge for Boston, scoring 18 points and having 9 assists and 3 steals. Paul Pierce had 13 points and Ray Allen added 12 points while Kevin Garnett collected 15 rebounds in the Celtics’ first loss. Meanwhile, the Miami Heat scored their first victory of the season in their second road game, beating the Philadelphia 76ers 97-87. Dwayne Wade had 30 points, LeBron scored 16 points, had 7 rebounds, 6 assists but turned the ball over 9 times. Chris Bosh finished with 15 points, but the real savior of the Heat was bench player James Jones, who scored 20 points, including six 3-pointers.